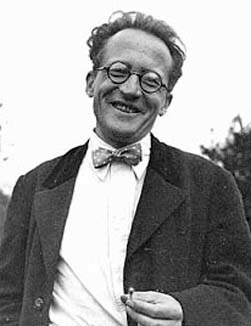 Erwin Schrödinger - Was a physicist who was one of the early pioneers in quantum mechanics. He is probably best known for Schrödinger's Cat, a thought experiment that demonstrates quantum indeterminacy. Also spelled: Schrodinger or Schroedinger when not fully supported by the alphabet. "A careful analysis of the process of observation in atomic physics has shown that the subatomic particles have no meaning as isolated entities, but can only be understood as interconnections. . ."
"Quantum physics thus reveals a basic oneness of the universe." "The scientist only imposes two things, namely truth and sincerity, imposing them upon himself and upon other scientists."